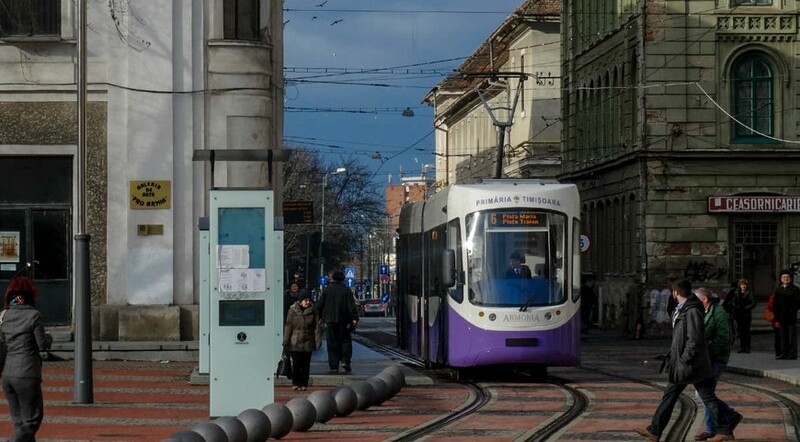 Most distances in Timisoara are relatively small, however there are a few bus routes of interest: E7, 11 and 14, that all depart from the city's main train station - Timisoara Nord. Bus no. E7 departs from the station and stops at Parcul Rozelor (alight at "Leonardo da Vinci") stop. Bus no. 11 serves the 1989 Revolution Memorial (alight at Punctele Cardinale) and the Theresia Bastion (alight at Oituz). Bus no. 14 serves the heart of the city; for Piata Victoriei and the Huniade Castle, alight at Piata Regina Maria, and for Piata Unirii, Piata Libertatii and the Cetate Synagogue, alight at Piata Timisoara 700. Tickets cost 2 lei and can be bought from RATT kiosks. They must be stamped in the machines once on board. There is a fine between 200 and 500 lei if you are caught with an unstamped ticket, or no ticket at all. Taxis are cheap in Timisoara and better than buses for longer distances. Just make sure you take a taxi belonging to a trusted taxi company, such as Euro Taxi Timisoara (tel. (+4) 0256 941). If you want to go on other villages, you can go there by train or by bus.